Figure 7-7.Hydraulic clutch operating system. Home > Construction Training Manuals > Construction Mechanic Advanced > Figure 7-7.Hydraulic Clutch Operating System. Figure 7-6. - Mechanical clutch operating systems (cable type of linkage). other mechanical systems use a flexible type of cable (fig. 7-6). These systems are normally found in automotive applications. The hydraulic operating system (fig. 7-7) moves the release lever by hydraulic pressure. 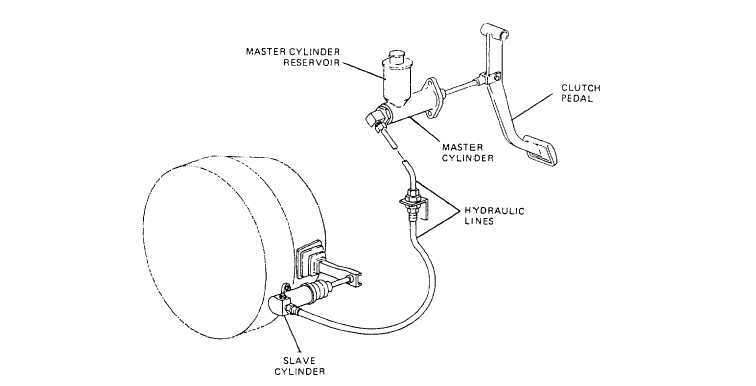 Depressing the clutch pedal creates pressure in the clutch master cylinder, actuating the slave disengages the clutch. Hydraulic types of clutch operating systems are normally found in heavy construction equipment where extreme pressure is required to operate the clutch. Figure 7-7. - Hydraulic clutch operating system.